Not a speaker? Here are four tips to present like a pro. “How am I going to get in front of all those people and speak?” It’s all a matter of knowing—and applying—four presentation tips that will make you look like you do masterful presentations every day! Most speakers, amateurs or professionals, speak too fast. Slow down. Pretend you are speaking to a huge room and project your voice to the back of the room. You’ll find yourself going slower and using more inflection (vocal dynamics) . Better delivery! There is a process for everything, including crafting a persuasive presentation. It’s simple. It’s the structure of your favorite popular tune: ABA. In other words, it starts with a theme, develops the ‘bridge’ in the middle, (supporting information to your point of view), and ends with the same theme. 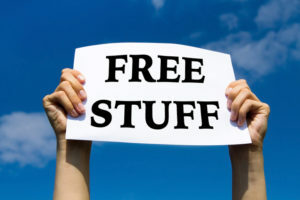 Free giveaway in this blog: Click here for my Persuasive Presentation process. How are you going to begin your presentation? With a provocative question? With a relevant story? How does that beginning tie to your theme? Sit down and write down your beginning. Post the problem, suggest your solution, and build a rosy future for following your recommendations. Have you ever been at a presentation that just puttered out at the end? The speaker said, “Well, we’re out of time.” And you thought, “Good”…..Remember, it’s just like a popular tune. Bring back the theme at the end. Close with reminding the audience of the rosy future they will have by following your recommendations. Remember, your job during the persuasive presentation is to persuade. And, here’s my point of view: All presentations that anyone gives should be persuasive. Otherwise, simply read a book! Are your courses boring? Are those presentations great for taking a nap? Are you instructors talking through every outline? And, most importantly, are your courses not filling up? It’s time to invite me to work with your instructor group. Contact me and we’ll work out the best solution for you! Share this with your presenters: Click here for my Persuasive Presentation process. Here are 4 ways your meetings go wrong, and a planner to assure they go right. This month, I’m focusing on the main responsibilities of a real estate manager. If you’re going into management, how are you going to make your meetings exciting, interesting, and participative? 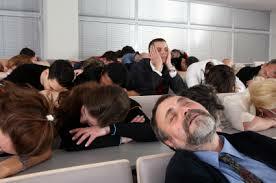 If you haven’t been in a meeting that went sideways, you probably haven’t attended enough meetings! I just attended a meeting that was almost painful to experience. It went on and on, with little organization. The speakers had no rhyme nor reason to their presentations. And, finally, I wasn’t even sure what we were to do as a result of this meeting! You may have the best event in the world, but, if you don’t let anyone know, all your planning will be for naught! Who is the event targeted to? What are the 3 major benefits to this target audience? Where will I promote it? The planner I created will help you avoid the 4 common mistakes listed above. It not only assures a persuasive presentation, it helps you promote the event, too! Click here to grab your Presentation/Promotion Planner. I’m Here to Help You Become a Great Leader! If you’re new to management, or you’re being challenged in management, I can help. My Leadership Mastery individual, custom coaching program will help you master the major activities of management–stepping you from ‘maintenance management’ to true leadership. Check out my program here. Contact me for a complimentary consultation. Going into Management: How Are You Going to Motivate? Going into management? How are you going to motivate? This month, I’m featuring blogs regarding going into management. Why? I’ve been interviewing for that next great leader. Unfortunately, I’ve found few candidates have prepared at all for management. (Read my earlier blogs for preparation needed). Managers need to be ‘up’, encouraging, motivational people. But, exactly how do we do that? As managers, we agonize over how to motivating our agents/employees. Yet, we generally know little about how motivation really works. 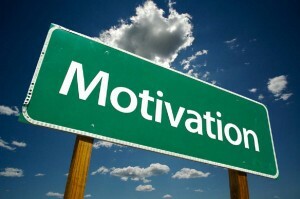 Here is one psychologist’s view on motivation, with tips on how to make it work for you in the workplace. What are some actions that achievers demonstrate? What are some actions affiliators demonstrate? What are some actions power people demonstrate? Which one are you motivated by? How do you know? Think of a time in your life when you were very motivated by something. Was that ‘something’ categorized as achievement, affiliation, or power? You can ask your team members that same question, and find out their dominant motivator (and just observe them in action, too!). To really put this to work, pick a person you manage that you find challenging. Pinpoint their main motivator. Try the actions McClelland suggests. I’ll bet you’ll not only get more cooperation, you’ll start to feel ‘in tune’ with that person–and provide the atmosphere for them where they can be motivated–their way. For your next sales meeting: Explain McClleland’s approach to motivators. Ask agents about 3 times in their lives when they were really motivated to achieve something. Then, explain the 3 categories, and ask agents to choose their dominant motivator. If you’re a new manager. You’ll want to cut your time frame by interviewing more effectively. You work so hard to gain those interviews. But, do you have planned interview process that assures you pick winners? (And assures the candidates are impressed with you….) 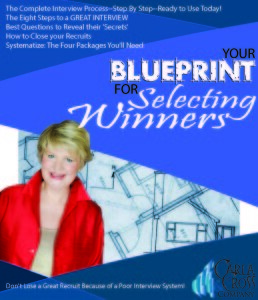 Your Blueprint for Selecting Winners, with new information about what desired agents of today are looking for, is a guide to create your unique attractors, how to put together a powerful presentation, and a completely new video showing exactly how to craft the best ‘crystal ball’ type of questions. Learn more here. Going into Management: How Are You Going to Train? So you’re thinking of going into management. 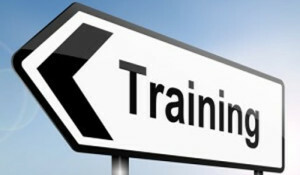 One of the great actions effective managers do is to create and implement a training program that actually gets results. I know you want to help others attain their goals, and training is one of the best ways you can do this–if you’re a good trainer, have great programs, and focus on measurable results. Grab your training calendar from your office (you do have a training calendar, don’t you?). Do you believe that training is getting the biggest ‘bang’ for your training buck (effort expended, talent needed, results expected)? Maybe you’re taking part in the training program. Are you frustrated because your training isn’t getting results? Or, people just aren’t showing up? Or, worse yet, falling asleep in that factoid-heavy class? If you have access to your office’s profit and loss statements: Maybe you have a specific problem you’ve noticed when you read your latest profit and loss statement. For instance: Perhaps your agents are giving too many commission concessions. When you go into management, you’ll see various challenges that training can solve (and some challenges training can’t solve!). 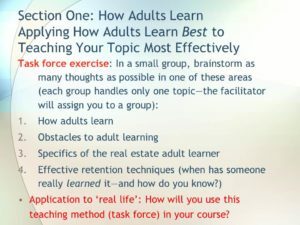 Decide which challenges you can solve by providing training (like increasing listings sold) and which challenges can’t be corrected by more training (ethical issues are hard to re-train to, since people’s ethics are pretty hard-wired into them in their early years!). Pretend now you’re in management. If you’re experiencing any of these challenges, you’ll love the tool here. I’m providing an insightful analytical tool to discover what’s right–and wrong–with your training. 3. It isn’t exciting enough–teacher just drones on and on…..
As I work with owners, managers and trainers internationally, I see these same three problems crop up over and over. From working with many managers over a period of years, I’ve created an analytical tool to figure out what’s good, bad, and ugly about that training program. Use it in your office. Or, if you have the guts, use it with your manager and then create a plan to create better training–with goals for specific, measurable results. Click here to get your analytical tool — along with tips to correct your training to make it pay off. Managers: Do you have someone you know would be a great manager? Start working with that person now. Get them into training. 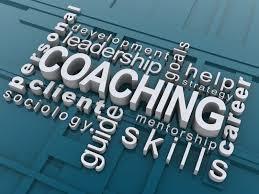 Have them take a great Instructor Development Course, team train, and, finally, start training on your program. Affiliates: Share this with the managers/trainers in the offices you call on. Use these tips, too, to streamline the training you provide. 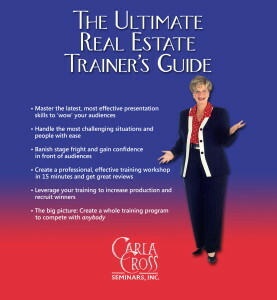 Here’s the comprehensive training tool that will help you create great training programs, become a confident, effective trainer, and help many more people succeed in real estate! Check it out here. How Much Time Each Day Should You Spend in these Management Activities? How much time should you spend in these management activities I’ve listed in the handout below? In my Leadership Mastery Coaching program, I provide several analysis tools to help new managers get started right with the best practices. At the end of this blog, grab my Time Analysis for Managers. Use this to set up your schedule (if you’re going into management). If you’re already in management or managing managers, use this to help managers get their priorities right for success. In my most popular book, Up and Running in 30 Days, the new agent’s start-up plan, I divide all the activities an agent could do into two categories: business producing or business supporting. Business producing are those activities where the agent is finding, working with, and closing clients. Business supporting are all the rest of the activities. Where do you think agents go wrong? They spend too much time in business-supporting activities. Now, let’s compare that to the categories and activities managers do. They also divide themselves nicely into busininess-producing and business supporting. (Take a look at my handout at the end of this blog). Where do you think managers go right in prioritizing their activities? They spend the majority of their time in business producing activities: Finding and working with productive agents. (not just crisis management, though). From working with hundreds of managers in my Leadership Mastery program, I see that successful managers spend the majority of their time in business producing activities. The failing managers spend most of their time in business supporting activities. In fact, they become masters of the technical aspects of the business, and spend lots of time preparing and playing technology. (Sound familiar to those of you managing failing agents?) There’s nothing wrong with knowing the technical aspects of real estate and using technology. But, the failing manager focuses and ‘lives’ there. Let me know how you used this analysis tool. General managers: What did you find when you had a manager use this tool? What changes will you help them make? Grab my Time Analysis for Managers. Use this to set up your schedule (if you’re going into management). If you’re already in management or managing managers, use this to help managers get their priorities right for success. This month, I’m offering some of my management resources free with purchase of other resources. Check it out here. Rate yourself on your management skills, so you’ll know what you need to work on prior to going into management (or if you’re already in management). Are you thinking of going into management? Few of us knew the skills–or the level of skill attainment–we needed to succeed in the job. I want to help all of you who want to go into management to succeed at a high level. Thus, these blogs. For the past couple of months, I’ve been interviewing potential managers. I’ve found that almost none had done any ‘prep’ work to go into the position. Yet, successful managers have developed specific, somewhat unique skills to do their jobs. And, what I’ve found is that these skills must be at least partially developed before we launch ourselves into management–or else we get swamped by all these new challenges hitting us in the face! In an earlier blog, I discussed the skills we need to have honed prior to going into management. In this blog, we’ll tackle getting those skills in certain areas. At the end of this blog: grab my assessment tool I use in my Leadership Mastery coaching series to help new managers plan for this skill attainment. What do you think it is? It’s recruiting and selecting skill. Why? Because, there’s so much competition for good agents that a manager just can’t sit back and wait for agents to come to them. It isn’t the old days (although I never was able to do that in my ‘old days!’). These skills are the same skills good agents use to expand their businesses. That’s why we need to hire managers who have been successful recruiters and selectors. Notice I said recruiters and selectors. I know companies brag about how mahy gross recruits they landed that month or year, but, long-term, it’s those who stay, prosper, and grow with the company that add to the profitability of all. How successful was that agent as a business getter? What’s the number of transactions you would accept? 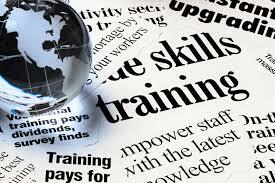 Your company may have a course focusing on these skills. If so, take it prior to going into management. Overall, the best courses out there for management are the CRB courses, leading to the Certified Real Estate Broker designation. I highly recommend them. Here’s the link. What’s Your Agent Track Record? In addition, if you don’t have a track record of at least 12-20 transactions a year as an agent, in my opinion, you have not developed the skills in recruiting and selecting you will need as a successful agent. It’s my experience that agents who didn’t actively lead generate will carry that habit into management. They will balk at lead generating for agents, and they will fight upper management to the death–and to everyone’s detriment. Grab the leadership skill assessment here. Managers or general managers: If you’re hiring a new manager, help them evaluate their skill levels and then create a training and coaching program to assure they get those skills before they launch their management career. Here’s how to find out if management is in your future–and how to prepare to succeed. ** See my prioritized job description of a manager as a handout–along with the number of hours I recommend you spend in each activity. Are you familiar with The CRB courses? These are offered by an arm of the National Association of Realtors, and are, by far, the best management courses out there. Here’s the link: https://www.rebinstitute.com/. It’s called Real Estate Business Institute now. I highly recommend the courses. When to take these courses? Before you go into management! They are offered throughout the United States (and some in Canada). 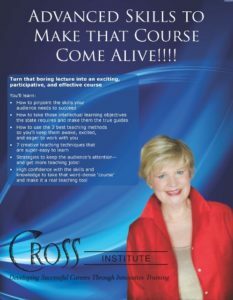 I was an instructor with the Institute for 12 years, and so I know the value of these courses (I also took several of them prior to going into management). Have you interviewed at least 5 managers to find out what they do and how they got the skills to do it? If not, start your interviews now. You’ll find a wide range of management descriptions, of course. Some managers will describe what I call ‘maintenance management’–keeping the place running by doing administrative duties and listening to agent complaints. That’s not what it takes today to succeed in ‘active’ management. In fact, I think a great manager can be compared best to a great or mega-agent. What’s your biggest challenge in management? What’s different from management than you thought before you went into management? How do you create a real team? How did you prepare to go into management? Suggestion: Ask for a copy of the manager’s job description. I’ll bet few of them have ever seen one! Here’s the link to the prioritized manager’s job description. Another way to prepare to go into management: See my management resources at www.carlacross.com.